With MILS it’s possible to create IT systems and solutions that take functional and information security requirements into consideration. This is particularly important in terms of ensuring an appropriate level of trust in computer systems that are part of a critical information infrastructure. The implementation of various system scenarios requires not only the ability to apply different security policies but also a prompt response to any impact on information and physical environments. These capabilities should not result in the loss of security guarantees for these systems. In some cases, maintaining security guarantees for such systems requires reconfiguring them to ensure they remain resistant to external factors. 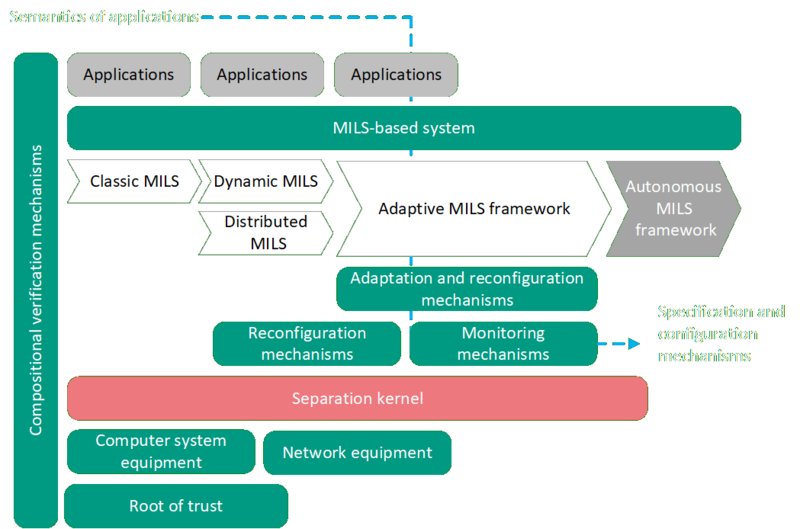 Dynamic MILS is intended as a basis for the creation of multicomponent systems that provide the ability to quickly reconfigure system components and the policies of their interactions (including security policies) without the loss of the guarantees received during system verification. Adaptive MILS implies the use of dynamic MILS to ensure system stability because of the rapid response to external events. The status monitoring system of the adaptive MILS is a mechanism for handling external events that can keep track of the execution of specified policies in a distributed heterogeneous environment and provide feedback for the adaptation and platform reconfiguration mechanisms. Kaspersky Security System serves as the basis for the system monitoring mechanism within the framework of the MILS adaptive platform. Research and prototyping of the adaptive MILS platform is carried out within the framework of the CITADEL project, partially funded by the EU’s Horizon 2020 program, grant 700665. The CITADEL project will build on the MILS technology accomplishments of D-MILS and Euro-MILS, and perform the research and development necessary to create adaptive MILS systems. We propose using adaptive MILS in new and evolving adaptive system contexts where there’s a strategic focus on use within the EU. These system contexts include critical infrastructures and the internet of things, where adaptability is a crucial ingredient for the safety and security of future systems, and where the rigorous construction and verification made possible by MILS holds particular promise. The project expects to achieve in its final phase the demonstration of the capabilities of the adaptive MILS platform in several industrial contexts and application scenarios, and lay the technical foundations for a certification framework for the use of adaptive MILS components and systems in critical infrastructure applications. The CITADEL Project is a collaboration amongst market-leading industrial organizations who operate critical infrastructures in Europe, leading software and platform technology companies, and research organizations that develop advanced technologies for security and reliability.